It was 1:30 in the morning when my pager went off. There was a house fire about eight miles from town. My first real, serious fire. As I struggled out of bed and into enough clothes to head over to the fire station, a part of me regretted having joined the local fire department. I didn’t grow up romanticizing the fire service or dreaming of joining a department. When I joined, I simply wanted to serve in my community and work for the good of the city that God had placed me in. I’m glad I’m not the chief. The fire service follows a strict chain of command in order to function as safely and effectively as possible in responding to a fire. There are formal lines of authority, responsibility, and communication that flows from the fire chief, through the battalion chiefs, captains, and lieutenants to the base level emergency responders (like me). Everyone has one direct superior to whom they are responsible. You can see a visual representation of this chain of command in this picture. 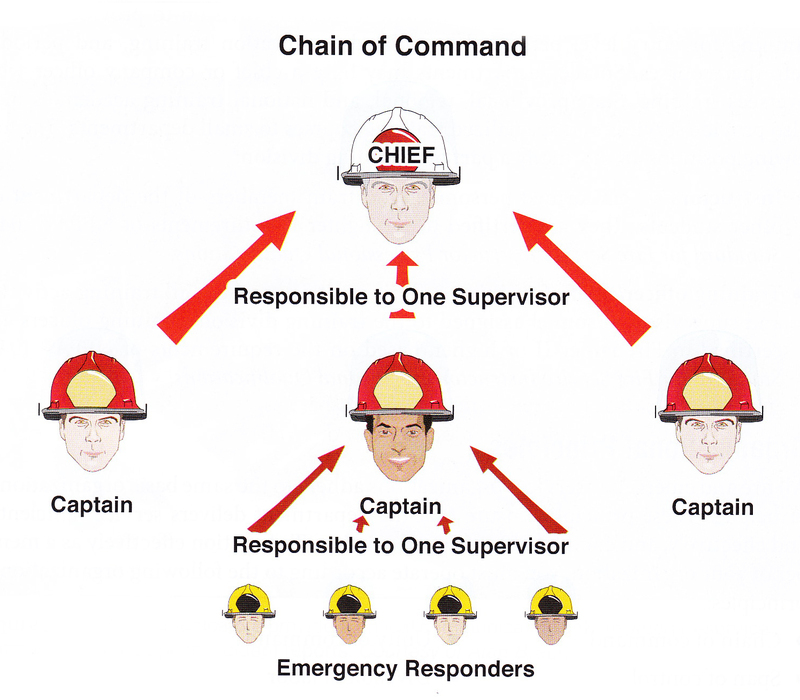 Fire Service Chain of Command. Photo from Essentials of Fire Fighting, 6th Edition. One of the reasons that this chain of command is so vital to our work as fire fighters is the need for clear lines of responsibility and communication in a crisis. During our fire, it was the two fire chiefs who commanded the captains, who in turn told people like me what I should be doing to help put out this fire. While I could communicate with my captain and he could receive my feedback, I am not allowed to go rogue as a firefighter. It is too dangerous for me and the victims. The crisis demands the type of clear communication and level of responsibility that is embodied in our chain of command. The benefits of this organizational structure for our work are myriad: clarity, accountability, decisiveness, expertise centered at the top. I’m glad we have this structure to support the important work we do as the fire service. I’m also glad I’m not the chief. The chief needs more knowledge, skill, and experience than I may ever have. After discussing the chain of command in my Fire Fighter I class and seeing it in action on scene, I began to try mapping this type of leadership onto the church. What would it look like if we ran the church like the fire station? Olga and I would be the chiefs, elders and deacons would serve as captains, and the rest of the congregation as the emergency responders. Clear lines of authority and communication. Expertise (supposedly) centered at the top. Swift, critical decisions could be made. I am not the chief of the church. I don’t want to be. On those rare days when I think ‘Chief’ instead of ‘Pastor’ would look better on my door, Jesus tells me this is not the way of his kingdom. His way calls for a different kind of humility and a different way of structuring our life together. The church is more than a fire station. It’s mission is more than “to save lives and protect property and the environment from fires and other hazardous situations” (as truly noble as that is). The church is about more than simply rescue and protection. It’s about a kingdom and, even more so, about the King. I’m not the chief of the church. The elders and deacons are not under my command, nor are the members of the body of Christ under the command of the consistory. We are not troops to be sent out, but a people that God is shaping. Every church believes that Jesus Christ alone is the Lord and head of the church, but different churches believe that there are different ways that Christ’s lordship is expressed in the church. While not necessarily discounting the others, I believe there is a particular wisdom in the way my tradition sees Christ’s lordship exercised. Our church has a presbyterian polity (from the greek word, presbuteros, meaning ‘elder’). We see Christ exercising his lordship from the discernment and wisdom of the gathering of elders, deacons, and ministers. When those whom God has called to these offices gather, pray, discuss, and discern where God might be calling the church, we believe that Christ is honored and that, by the Holy Spirit, he is at work among us. Is it perfect? No. Do we make decisions quickly? Not by a long shot. Do we look more like Christ’s body when we discern together than apart? I believe so. I am not the chief of the church. Olga and I do have power and a unique place within the church. We have no illusions that we are powerless or without influence. But we also have no illusions that we run the church. The church is not run in a top-down fashion. The wisdom of our tradition is drawing on the wisdom of scripture when it calls for us to share power and responsibility. It’s not our church, it’s not their church, it’s Christ’s church, where we have all been called to serve. And the greatest must be a servant, like our Savior was. We meet with elders and deacons to help discern together where God might be leading us. Hopefully, through this messy and glorious process, the church is shaped not into the image of Stephen and Olga, but into the image of Christ. In firefighting, I’m glad we have a chief. In the church, I’m glad that we don’t. I’m glad we have elders and deacons to lean on for wisdom and discernment. I’m glad that everyone – great and small – has a voice and can contribute in the church. I have been enjoying your blogs (Olga’s, too). I have forwarded this one to a few people. It’s interesting to look at the substance of your blog in light of the Episcopalian polity. While we have a bishop, I still believe that we ought not to consider the bishop as the chief. I think that was one of the problems we had with Father Kaminski. He made it pretty clear that things would always be done his way, and that he wasn’t very interested in anyone else’s input. I believe that we are a community. I believe that the pastor/rector is called to guide us and nurture us, but not to rule over us. Same with the bishop. The bishop can give us a hierarchy that ensures some degree of continuity, but the bishop ought to listen to us. When someone has to make a decision, that’s his job, but he ought to consider the needs, concerns and ideas of the parishioners. I’ve heard it said many times that the Episcopal church is not a democracy. It’s what typically comes up anytime anyone wants to look at a different way of doing something. I always hear it from someone when I go to a church in conflict. I respond by saying that I agree, but that I also would posit that the Episcopal church is not a dictatorship or a totalitarian regime. When people know that they will be heard, they are far more willing to accept that they can’t have their way all the time. It’s when they feel that they have no voice that they typically engage in counterproductive behavior. I have said it before, but it bears repeating. I am very proud of you–of the path you have chosen, of your commitment to what you do, of your compassion and humility, and of your willingness to take on difficult things. 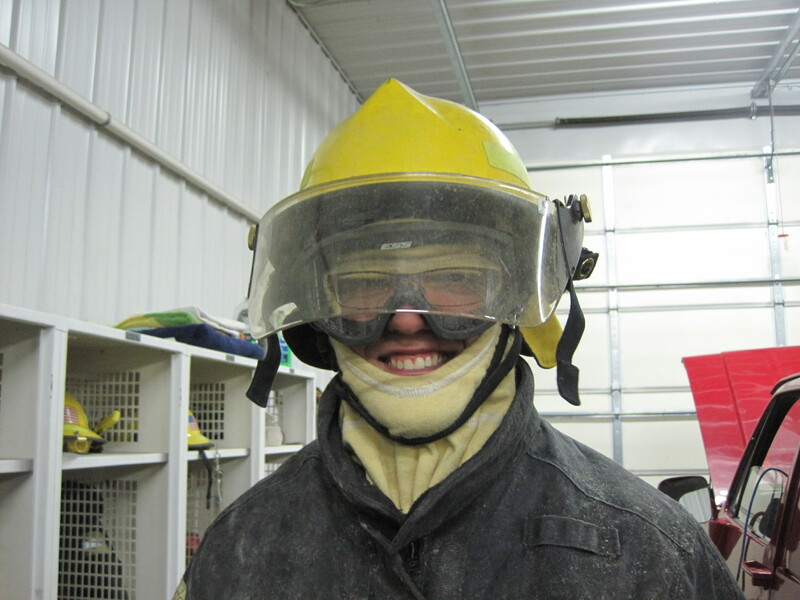 It must have been quite an experience to be at an actual fire…whew! I get a little adrenaline rush just thinking about it. And I am not worried about you doing it. I know that you will use good judgment at all times. I know that Susan would love to start receiving your blog. Can you send her an e-mail at susanathalyn@gmail.com ? Thanks. Sorry I have not called. It has been somewhat chaotic here, and it always seems like something is going on. Will try to call you over the next few days. I think you are right that shared leadership and power should be present in Episcopal polity as well as Congregational polity. The type of leadership I mentioned is not unique to presbyterianism, but I think our structures are designed to prevent ‘chiefdoms,’ even though it doesn’t always work. While I agree with the importance of listening and receiving input, I think it is even more important for ministers to realize that they do not have all the expertise or wisdom required to lead the church. God is omniscient, we are not. And that’s okay. Removing that pressure can make it easier to listen and receive input. Thanks for your thoughts, I hope to hear from you soon. I am learning here that the slow changes made in the church are actually a good thing. I like your view of different kinds of leadership. Firefighteres need their kind we need a different kind.